Way back in the day when I was living in Iwate and spending a lot of my time lounging around in the free English library in the Iwate International Plaza, I found a funny little book called 'The Joy of Sumo' (by David Benjamin). It's a humorous introduction to the sport and though now the bits about specific wrestlers are pretty outdated (it was written just about when Taka/Waka were rising to fame) a lot of the observations are hilarious and spot-on (cute illustrations too). He's the best of the best, and really needs no introduction so I usually just think of him 'The Man' or with a bit of a nod to Heinlein, 'The Man from Mongolia' or sometimes just 'Asa'. (There are a lot of guys with Koto (meaning the 'koto' or Japanese zither) in their name and they're almost all from Sadogatake stable. It's a tradition in sumo for the wrestlers from the same stable to have names sharing a character, which (I think) is to honor a particularly illustrious forbearer or elder of their stable.) 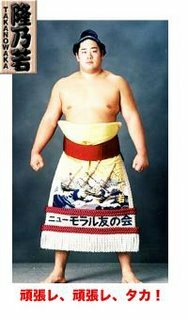 Anyway, the first time I saw Kotomitsuki all I could think was that he looked like an adorable giant baby, so I call him 'Babyface'. He's also a blogger, so that's his nickname: 'The Blogger'. I've included a link to his blog. It's all in Japanese, but you can check it out if you want anyway. Whenever he loses a match he gets this cute little pout on his face, and looks for all the world like a kid about to start bawling his eyes out, so I call him 'The Crybaby'. He's had his nose broken so many times that in profile it looks like he doesn't even have one. Therefore his sobriquet is 'No Nose'. 'Cheap Horse' has got to be the stupidest fighting name ever; I love it! He's a scrappy little guy too, always pulling off crazy saves at the last minute, and he really deserves a more dignified title, but 'Cheap Horse' it is. Foreign wrestlers often have names indicating where they're from and Kokkai is no exception. He comes from Georgia (the former Soviet Republic not the US State) which is on the Black Sea. His nickname also follows my pattern for European Wrestlers namely 'The *National Adj. * *Alliterative Warrior*'. Thusly, he is 'The Gurujian Grappler' (Gurujia, of course, being the Japanese pronunciation of Georgia). Same as Kokkai and Koto'oshuu, one of the new breed of Eastern European powerhouses. Known to all and sundry (or maybe just me and John) as 'The Russian Rumbler' or alternatively (and I do love Rohou and mean this is in the best way possible), 'The Ugly One'. A perennial fan favorite, he's known in the media as 'Robocop' due to his outrageous pre-tachiai psyche-up routine. He's cute but not all that great of a wrestler, and for a while I thought he might be seriously mentally out-of-it until Luke suggested he might just be nearly blind (Luke has his own cruel nickname for him as well, but I won't publish it here) so I call him 'Blind as a Bat' (which is, I admit, not much better). Even though recently he can't seem to win a match (he's currently 0 for 6) I still love him. Ever since the first time I saw him at the Morioka Tournament (our eyes actually met momentarily; *swoon*) I've been smitten with him. I like to call him 'My Honey' and other such terms of endearment. He's colossal (6'3", 399 pounds). Even though there are other wrestlers who are actually taller (Koto'oushuu is 6'8" if you can believe it), he *seems* the biggest presence-wise. Which is why I like to call him 'The Big M*ther F*cker'. 'Gorilla' or 'Monkeyface', pretty self-explanatory. He's another of my favorite wrestlers, partly because he's one of the few who seems intelligent when interviewed after a match. He also looks really cute wearing his glasses and he has a nice smile. 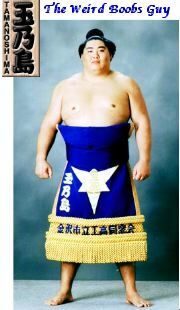 Before the match each wrestler has their own little warming up routine that they like to do (Asashoryuu rotates on the ball of his foot, slaps his mawashi really hard and rubs his pits vigorously, Takamisakari shrugs his shoulders like a bull preparing to charge and then hits himself repeatedly in the face, Tamanoshima thumps himself once powerfully on the chest and on and on...) Kitazakura's thing is to basically up-end the entire box of salt into his hand and throw it in the air as though he was trying to seed the dohyou or something. Therefore I have dubbed him 'The Saltshaker'. Probably the cutest wrestler, I just wanna give him a big hug. He's so perfectly sweet and round; I call him 'Butterball'. Collectively known as the 'Momiage Brothers' or 'Mr. Momiage 1 and 2'. They both have luxurious muttonchops (in Japanese 'momiage') which the ringside commentators are sure to commentate on whenever they battle each other. They like to call it a 'Muttonchops Battle'. Anyway Goog Niter to everyone, and be on the lookout for more sumo highlights, and hopefully also reviews of 'A Rabbit's Eyes' by Haitani Kenjirou and 'Oranges' by John McPhee. A lot of pretty standard matches today... I'll just give some highlights. Kotonowaka vs. Kyokushuuzan (琴ノ若ー旭鷲山) This was quite a long match by sumo standards, but the best part was that the two wrestlers in trying to get a decent grip on each other's belts spun around in a circle about 3 or 4 times almost like a dog getting ready to sit down for a nap... It was very funny. Kyokutenhou vs. Kakizoe (旭天鵬ー垣添) This was a quick match, and at first it seemed that Kakizoe had won, but then there was a monoii (refs conference) and they disqualified him because he grabbed Kyokutenhou's hair, which is a big sumo no-no. PS Tomorrow I should have a post up about some of the nicknames I have for the various (!) 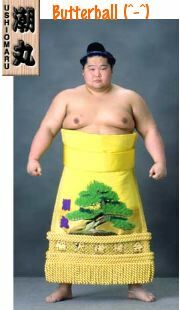 sumos. I had originally planned to do a little write-up after each day of the tournament, but being the lazy b*stard that I am, I've decided just to do the write-ups on a more random 'when-I-feel-like-it' kind of basis. So we'll begin the tourny on day 4. Tama'asuka vs. Kotonowaka (玉飛鳥ー琴ノ若): A pretty standard match, but unfortunately Tama'asuka broke his ankle and will be taking off the rest of the tournament. Kaiou vs. Hokutouriki (魁皇ー北勝力): Kaiou showed everyone he still has what it takes to be an oozeki, and basically took Hokutouriki apart before he even knew what hit him. It's good to see him back on track, even if he is kadoban (again). Chiyotaikai vs. Kakizoe (千代大海ー垣添): Chiyotaikai is back in (almost) peak form again too. He gave Kakizoe a taste of some pretty sweet tsuppari (or as the Japan Times invariably calls them 'his trademark arm-thrusts') before pulling him down and then tumbling halfway across the ring himself and finishing with a rather acrobatic half-somersault. Asashouryuu vs. Dejima (朝青龍ー出島): A good match, the only surprising thing being how long Dejima was able to withstand Asa's fearsome onslaught. Most everybody that goes up against the Man from Mongolia gets schooled within the first 5 seconds of the match, but Dejima hung on for a good 20-30 secs and even resisted an arm-throw or two. That's it for now! Goog Nighter! I just saw the funniest news story ever on the TV. And they did! The daikon was returned to the scene of the crime, but unfortunately having been plucked once it seemed unlikely that it would be able to be replanted. The best part of the story though was the interview with an old guy from the neighborhood. Interviewer: "So how do you feel about the theft of the daikon, sir?" Old Guy: "I think it's very sad, and I feel a little pissed off!" P.S. I am so excited ! As I sat here typing this blog entry the door-bell rang and my first ever books were delivered from Amazon; COD!!!! Woo hoo! 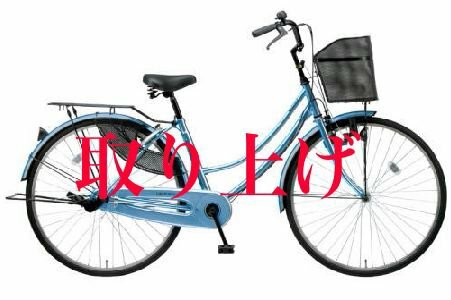 And, to top it off I went to pick up my bike from where I left it at the station and I find it's been frickin' carted away by the city and I have to go to Flowertown and pay almost ¥2000 to get my own bike back!!!! P.S. Except that apparently it wasn't and I had just forgetten where I'd left it.